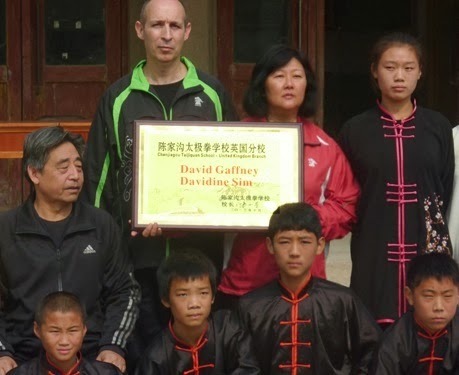 My first visit to Chenjiagou - the village where Chen style Taijiquan was created - in the summer of 1997, was a pivotal moment in a martial arts journey that had begun nearly two decades earlier that, like many others, took place in a local karate school. On that visit in the Village Taijiquan School I saw a series of demonstrations that captured the breadth of the Chen family art of Taijiquan. Chen Taijiquan is built upon a complex philosophy and methodology that is often misinterpreted and misunderstood. It requires the body to be used in a distinctive and unique way. To achieve this, all aspects of the traditional syllabus must be recognised as being interconnected and mutually supporting. Taking a whole syllabus approach allows one to maximise the benefits of practice. From an individual’s first contact with the system, from training the standing pole, through the curriculum of basic exercises, continuing to form (hand and weapons) training, to push hands etc, until final mastery. Progression through the different stages should be approached in a methodical and ordered manner. While you cannot underestimate the importance of hard physical training, one must also try to understand the multiple layers contained within each technique. Over the course of a short series of articles we will take a look at how the seemingly separate parts of the Taijiquan syllabus are related to each other. This first instalment takes a look at the relationship between form training and push hands. An old Chenjiagou saying suggests that “walking the frame is hitting hands and hitting hands is walking the frame”. Walking the frame refers to form training, while hitting hands was an early term used to describe push hands. The inseparable relationship between form training and push hands has been clearly established by generations of acclaimed Taijiquan practitioners. Historically there are no Taijiquan practitioners who were not also well versed in push hands. Likewise, there are no Taijiquan masters who are not skilled in the form. Genuine Taijiquan skills are the culmination of an extended period of training in both of these facets. All the body and movement skills that can be used in push hands and combat should first be honed through diligent form training. To use Taijiquan as a combat art, both form training and push hands have to be seen as complementary and vital. Training the form without doing push hands, while giving some exercise benefits, will not equip an individual for combat and self defence. Conversely, if an individual just does push hands without the foundation of form training, while they may develop certain techniques, they will not be able to use these to their full potential. Therefore, the experienced practitioner should train form and push hands concurrently, without favouring one over the other. While the less experienced practitioner must accept that form training is the basis and foundation upon which any future push hands success is based. The traditional way is to first put the building blocks in place – a strong unmovable base, co-ordinated movement, agile footwork. Cultivate the correct energetic qualities – weighted at the bottom, light at the top, expanding from inside to outside and fullness in the dantian. With this basis develop an understanding of Taijiquan’s different types of jin or trained power – peng, lu, ji, an etc. Form training or Taolu enables one to develop correct posture, to synchronise the different parts of the body and to increase co-ordination to the point where action is characterised by integrated whole body movement. The traditional insistence upon a long period of form training is Taijiquan’s means of developing optimal movement skills and conditioning before beginning push hands training. It is wrong to assume that the learner can achieve a high level of push hands ability just because they train hard. They may develop strength and improve endurance, but what are their movement patterns like? Throughout the course of their lives, most individuals develop poor habits of body mechanics and lose the original mind-body unity, suppleness and naturalness that were their original innate state. Trying to function with inefficient posture or motion is akin to driving a car with the handbrake on. If you are driving your car with the handbrake on, the way to boost performance is not to put a bigger engine into the car, it is to release the brake. If an activity is practiced with poor form, the poor form will be part of the information recorded in the individual’s motor programme. Beginning to train push hands, with its complex patterns of movement, before correcting these bad habits means that these inefficient habits of motion are inevitably carried over into the newly acquired movement skills and are further reinforced. Physical motor programmes, therefore, must be developed and refined so the practitioner can perform effectively under varying conditions and high levels of physical and mental stress. To return to the car analogy, only when the car is running as well as it should in the first place does it make sense to “soup up” the engine. Consequently, it is much more efficient to first inhibit and release poor habits and then, building on this foundation, train push hands. The physical structure and the movement quality gained from form training provide the basis for all subsequent skills. Push hands serves as a feedback mechanism for testing the efficacy of these skills. While an individual may think their movements are accurate in terms of Taijiquan’s strict body requirements and that their posture is stable and rooted, pushing hands with a partner quickly highlights any contradictions. Where postural and movement accuracy are put in place through form training, push hands reinforces the necessity for this accuracy and allows the practitioner to further refine and tighten up the form. For instance, if during push hands the waist turns too much and a partner is able to capitalise on this loss of position, this information can be fed back into the form. Waist movement can be reduced and in a little while the testing process can be repeated. In the above context, push hands and form training are explained in terms of developing one’s own capabilities. A second vital area is learning to recognise the capacity of an opponent. While push hands training sensitises an individual to the movements of an opponent, this is a double-edged sword. The Taijiquan practitioner must also accept that his own movement may be read by his opponent. Even as an exponent is feeling for the tell-tale signals giving away the intention of another, he must learn to recognise his own anticipatory movement. This is one of the reasons why the form is practiced slowly and meticulously. By minutely examining each movement one can begin the process of thoroughly rooting out any “telegraphing” of our own intention. In form training the requirement is for tendons and bones to be loose and for each joint to be connected so that energy fills the whole body. In time the body becomes light and agile. These provide the necessary foundation for the essential push hands skills of ting jin and dong jin, or “listening skill” and “understanding energy”. Like form training, push hands training should be approached systematically. First looking to develop the skill of listening to and following the movements of an opponent and then eliminating the mistakes of disconnecting from your opponent, over-reaching and resisting with force. At the same time, training push hands helps the individual to take a step forward in their understanding of the form as regards the qualities of “song rou chen wen” or looseness, suppleness, sunkeness and stability. During form practice an individual may be unsure as to the correct degree of looseness, softness etc. The feedback gained through push hands greatly helps in establishing the correct functional level of these aspects. Uncovering all the places where movement is inefficient or lacking the necessary smooth and spiralling quality, one gradually reaches the point where it can be said that we “know ourselves.” When you reach the point where your movement is smooth and coordinated, and you have understood the idea of following an opponent’s movement, then you can begin to examine the application possibilities within the form. Generations of past masters have left a valuable oral guide to today’s practitioners. Those impatient to get past the form and to get to the “real stuff” of Taijiquan push hands would do well to think about the clear directions that have been handed down. Sayings such as: “Profound principles emerge by themselves after you practice the form ten thousand times”; or “Skills come naturally when you are familiar with the forms”. Push hands has traditionally been used to examine the quality of gongfu that an individual has attained through training the form. Whilst form training is a vital component of Taijiquan training, it is important to remember that at the highest level Taijiquan is formless, especially in terms of practical usage. An individual should be able to improvise and react to whatever challenges posed by the opponent, making use of all the principles and insights gained from form practice and applying them to the situation. 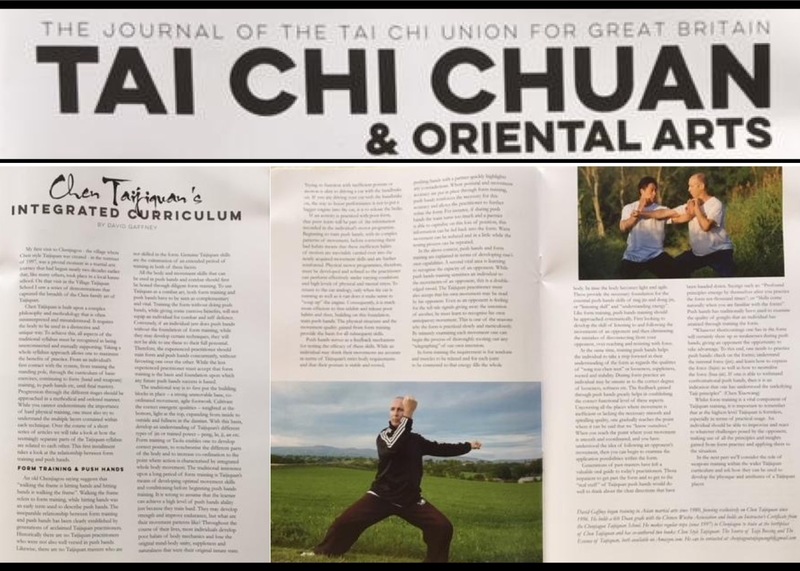 In the next part we’ll consider the role of weapons training within the wider Taijiquan curriculum and ask how they can be used to develop the physique and attributes of a Taijiquan player.